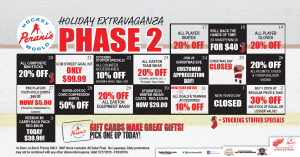 Our holiday extravaganza month of deals is still going, with phase two offering some of the biggest sales you’ll see on hockey equipment and holiday gifts anywhere! Even though there are just a few more days left to get your holiday shopping in, it doesn’t mean our deals are stopping (since we know a lot of you haven’t even started yet! 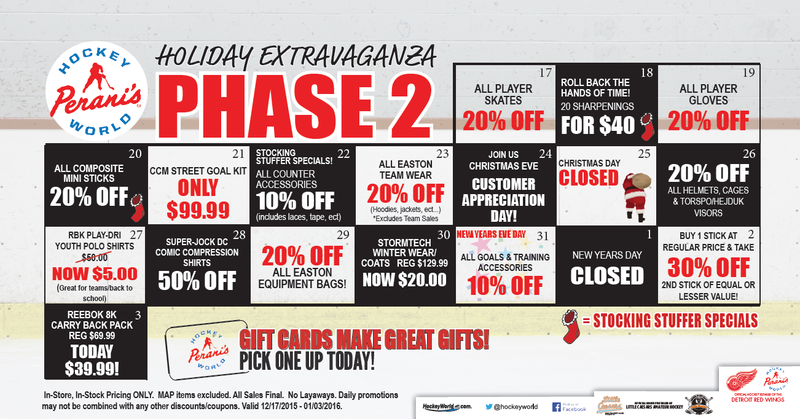 ), so take a look at some of the best deals and steals Perani’s is offering to round out the holiday extravaganza. Some of these will blow you away – we guarantee it. Too many good deals to make a decision? Don’t worry – we’ve got gift cards of all sizes (and values) – a fan favorite holiday gift year after year! Remember, these specials and discounts are good for in-store and in stock pricing only. You can stay up to date with our holiday deals and specials by LIKING us on Facebook.